Steiff Belly Rabbit Music Box is hand made in the finest pink cuddly soft plush. 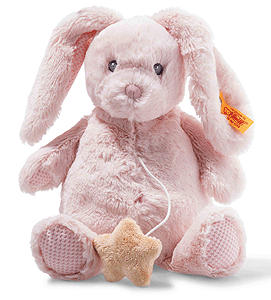 Soft Cuddly Friends Belly rabbit is made of pink, baby-soft plush fabric. When you pull the sewn-on star, the melody to "Weißt du, wie viel Sternlein stehen" ("Do You Know How Many Stars There Are?" a popular German lullaby) begins to play. Belly rabbit has funny, long floppy ears and a cotton tail; bean bags are sewn into his bottom, arms and feet. His eyes are embroidered in grey. His inner ears, soles and paws as well as his nose feature a soft and pretty material mix. The music box cannot be removed.